The Gunpowder dropped close to 100 CFs last week. The river gradually leveled out after the big surge of water on the 11th. Heavy rains last night bumped river flows up to 165 CFs. The Spring rains should provide good flows the next few months, since the river levels will fluctuate with rain and spillover. The City notified the shop they recently made a gate change to the 10 foot level at Prettyboy, and the temperature graph on the USGS shows a spike up to just over 48 degrees. 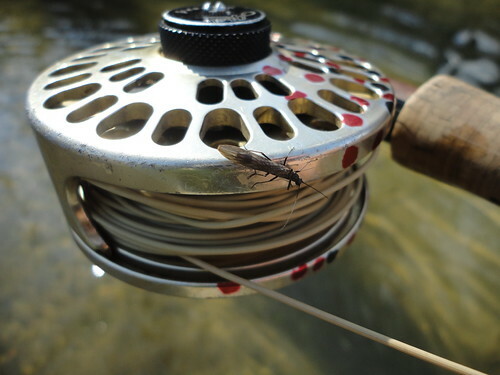 Angler reports from last weekend of slightly off color water was likely the result of the reservoir thermocline “turning over.” The water cleared early this week, and I witnessed increased hatches of midges and blackflies. The days when the air temperature hit the sixties I saw stoneflies hatching in more numbers each day. One afternoon I watched a few dozen drop out of the hemlocks onto the water. The occasional splashy rise could be seen, but the rises to stoneflies were sporadic. The midges and black flies were what the steady feeders wanted on the surface. The black flies are more plump in the body than typical midges, so the fish were very selective. I found a few pods of risers working the surface over two hours and caught some browns, and missed quite a few others. The rest of the fish I caught using tiny larva patterns we have in the shop. The extended weather forecast shows a slight drop in temps over the weekend, but next week rain and highs in the fifties. Water temps approaching fifty and fluctuating flows should make for ideal fishing conditions in the coming weeks. In the latest video post I filmed some blackflies, a few browns, and nice sized rainbow I caught. This entry was posted in fishing report, video on March 24, 2011 by Jason du Pont. 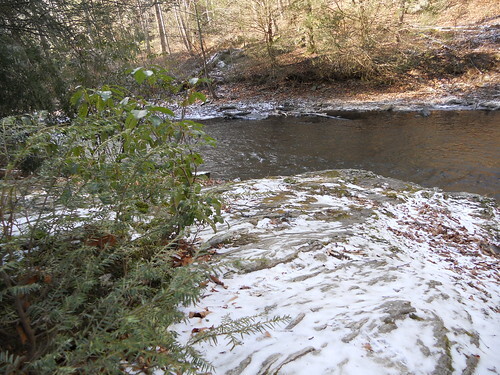 The Gunpowder River reached just over 700 CFs on the Falls Road gauge this past Friday. The heavy rainfall in the region filled Prettyboy Reservoir, and water crested the spillway. The initial surge of water may not have led to ideal fishing conditions, but the flow did dislodge a good portion of Didymo from the river bottom. I fished for a few hours at 600 CFs, and caught half a dozen fish, but also noticed Didymo washing down river. The white algae can still be found in most sections, but is far less of a nuisance compared to the previous months. Earlier this week flows dropped back to a more manageable level, and I fished on Monday and Tuesday. The river was clear at 200 CFs, which was a great flow. I caught fish in the slower, softer water on nymph and midge patterns under an indicator. I fished upriver with nymphs and switched to streamers for the walk out. Streamers produced a few fish, but my hook up ratio was better on nymphs. Midges and blackflies hatched throughout the day, and most of the browns I caught took size 18-20 larva patterns. It was great to see the river with a good volume of water, and fun fighting fish in the higher flows. The river jumped again after last night’s rain, but will likely level out between 150-200 CFs by the weekend. A new feature of the USGS gauge at Falls Road is a real time temperature graph. Water temps in the Gunpowder are reaching 43 degrees in the afternoons. The ten day weather forecast shows daily highs in the mid fifty to upper sixties, and scattered showers. The reservoir is full and spilling, so the flows will fluctuate with rainfall, but will remain clear and fishable in the upper miles. This entry was posted in fishing report on March 16, 2011 by Jason du Pont. I stopped by Prettyboy Dam yesterday to check the elevation levels. 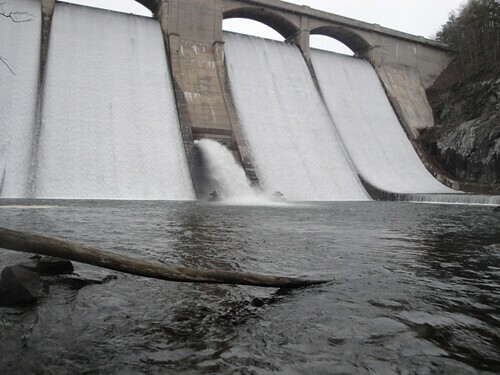 The water is lapping at the top of dam. 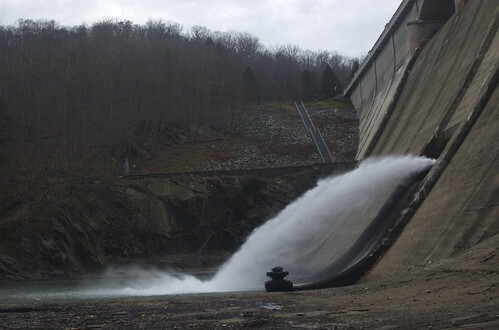 The reservoir needs to rise less than twelve inches to crest the spillway. The ten day forecast predicts showers over the next two weeks. The Gunpowder could see an increase in flow in the near future, and provide ideal fishing conditions. The river may rise, but will remain clear with spillover. If the Falls Road gauge shows a big spike, don’t assume the river will be blown out. Fishing is possible in the first few miles of river, even after heavy rains. In most instances the tributaries below Masemore Road blow out the main river, but the upper section remains clear. This entry was posted in fishing report on March 8, 2011 by Jason du Pont. I strung up my Bob Summers #3 and grabbed my gear. What happened? I dropped into the gun at Corbett rd and noted that my favored log jam had been cut free and removed. That was one of the best fish covers between Masemore and Glencoe. Not long ago I stopped to peer over the bridge in that same spot and check for Browns and there were plenty clowning around in the logjam. Sad to see this Theaux, yet after surveying this stretch with dead drifts using a bead-head prince with a touch of flash, I scooted downstream to test the riffles. After clearing my line from a triumphant bird nest tangle my line layed out beautifully and felt the ‘cosmic throb’ we all pray for. I did not see the fish, but boy did I feel him. Heading back to the car I saw a pair of Northern Harriers; the sighting of raptors always make me smile. Early spring greetings. I finished up some chores around the house on Sunday and the fishing bug bit. I grabbed my gear and headed for you shop. I talked to the young guys at the shop (very helpful by the way) and grabbed some recommendations out of the muffin tins. A pink weenie worm and some small nymphs to work in tandem. Hit Masemore and just had a great time. Had one strike near the power lines and pulled it out of the fish (winter rust). Never had another hit but the weather was perfect and the stream was beautiful. Saw one older gentleman with what I could only assume was his grand daughter (maybe 10 years old). I just layed on the bank and watched him teach her how to cast a dry. My main reason for writing is clearly not the fish that I landed, but to tell you about a conversation I had in the parking lot with a gent from Pa. He was huffing and puffing about the upcoming felt sole ban. He informed me that the DNR would have to catch him as he refused to go to “slippery rubber soles”. I nicely informed the man that I had in fact switched to Chota’s in the summer and have fallen in love with them. I studded up and have never had an issue. I think they may be more secure than felt. I fished the Niagra, the Elk, and the Grande this winter with fast high water and icy rocks underfoot without issue. Sunday was nice but the north trails still have a lot of packed ice on them and I never slipped a bit. If we can get the word out that these Chota’s and Simms are very, very secure when studded it will do the rivers a lot of good. I did have a few hang ups in the Didymo and it just drives the point home. I tossed my old felts in the can yesterday. This entry was posted in fishing report on March 1, 2011 by Jason du Pont. 10 AM till 5 PM Thurs. to Mon.